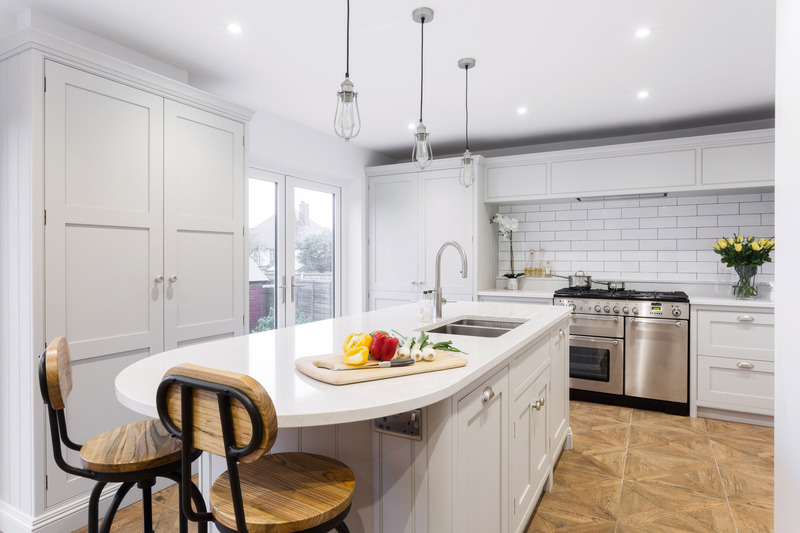 They wanted a kitchen that had plenty of storage and was user friendly for all the family, so commissioned Burlanes to transform their cramped and dated kitchen into a spacious and open-plan room. 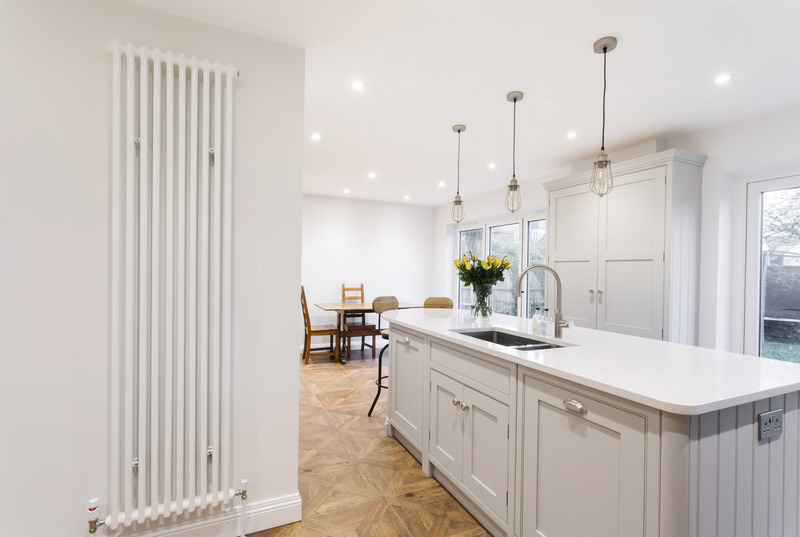 Walking into Burlanes Chelmsford, the couple took an instant like to our Wellsdown kitchen; our take on the classic Georgian country kitchen; built on the notions of good proportions and symmetry, combining traditional charm with all the benefits of modern living. 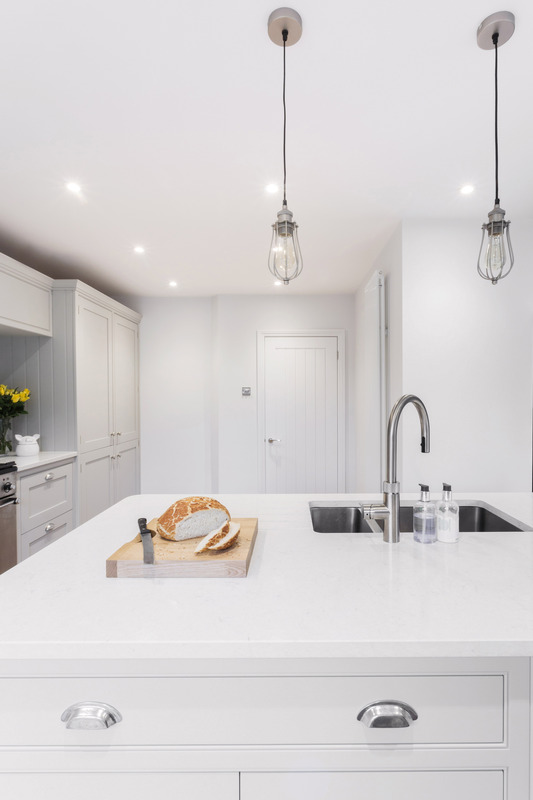 Within 2 weeks, the Burlanes site team had begun demolition works on the dividing wall between the existing kitchen and dining room, and production on the homeowners' new kitchen had begun at the Burlanes workshop, to create and build the beautiful light-soaked kitchen the family had always dreamed of. "I cannot thank Burlanes enough for the fantastic kitchen they have given me and my family. From our first meeting at the Chelmsford showroom to the final sign off with Andy and the installations team, every person I have dealt with has been highly professional and 100% focussed on providing me with my dream kitchen on time, to schedule and with the highest quality finish I have ever seen - it is immaculate! It encourages even me to want to cook!! I cannot thank Burlanes enough and would recommend them to anybody, so much so, they are now doing my bathroom too...!" 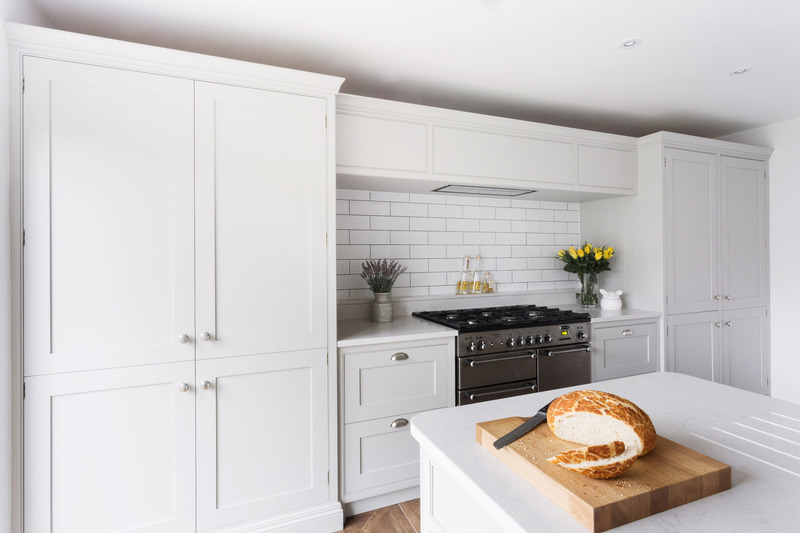 Hand painted in 'Cornforth White' by Farrow & Ball, the kitchen island is the main attraction; the social hub for the family to sit together at the breakfast bar before the school run or help prepare the vegetables for Sunday dinner. This large island has so many practicalities with the integrated sink, dishwasher and recycling and rubbish bin, keeping the need for free-standing utilities to a minimum, giving a streamlined look. 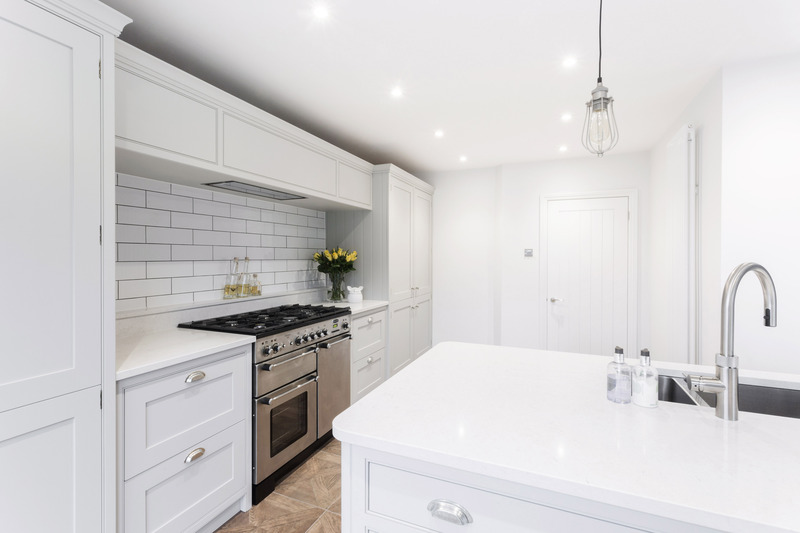 The open glass doors make this kitchen look even more of a spectacle with the natural light spilling through, a light coloured kitchen bounces the light around the room and it always looks fantastic. The Quooker Flex boiling water tap is a must have feature for any family kitchen. Instant boiling water straight from the tap, with a child-proof 'double-push-and-twist' action, so no nasty accidents. The Quooker Flex has a unique pull-out hose making rinsing and cleaning pots, pans and dishes much easier, and an extra safe instant stop mechanism for the boiling water, should the flex hose be accidentally pulled out when in action. Our made-to-measure cabinetry means you can have cabinets any size, to suit all of your needs. 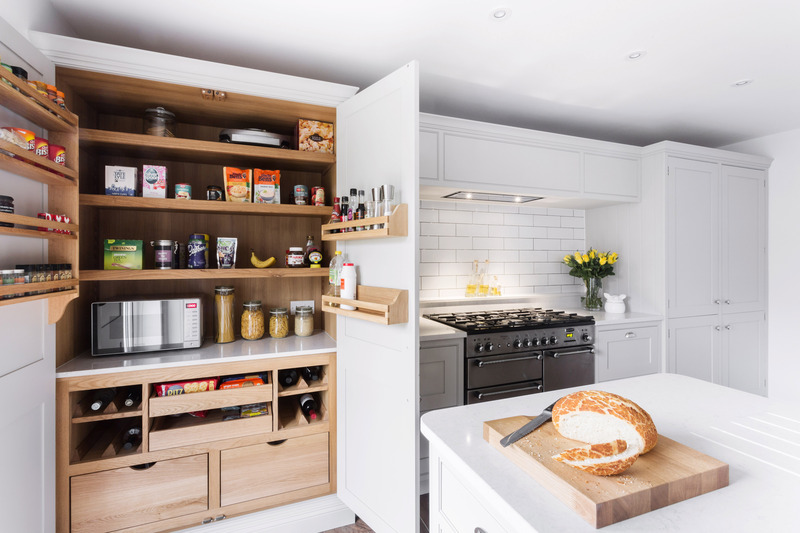 Mr & Mrs Hills opted for our classic Burlanes larder unit, meaning that everything can be stored in one place, making dinner time a smooth operation. Our unique adjustable shelving gives you the option to reorganise the larder however works for you, or simply move a shelf higher to keep little hands from sneaking treats! To create balance and symmetry to the kitchen, a utility unit was incorporated into the run of cabinetry along the rear wall. 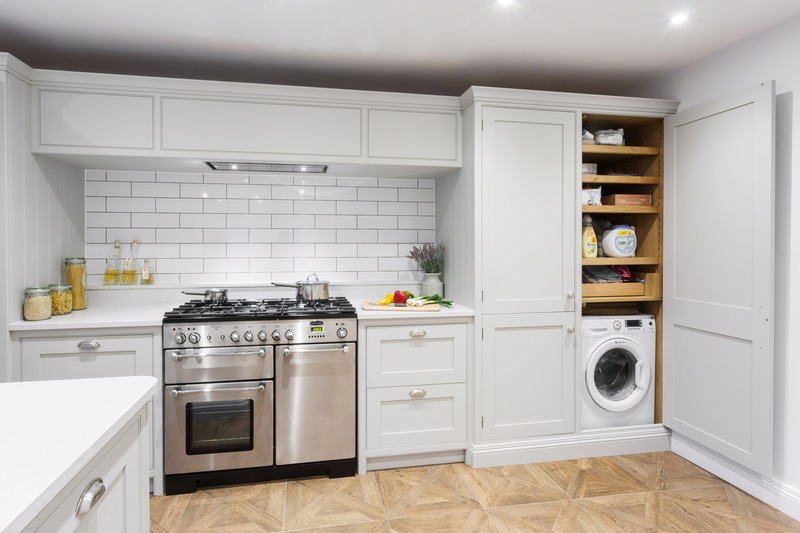 Mr & Mrs Hill wanted a utility room without having the availability of a spare room, and we were able to design and create a utility cabinet within the kitchen, utilising all available space. Plenty of room for washing detergent, cleaning cloths and the washing machine, all within arms reach. You do not need to have lots of space to have a hard-working utility room, a designated area of the kitchen will do the trick! At Burlanes, we love practicality and giving all available space a purpose; designing a large free-standing cabinet gave Mr & Mrs Hills the extra storage space to keep all other bulky items neatly tucked away, would you believe the ironing board, vacuum cleaner and clothes airer are comfortably sitting inside of this beautiful cabinet behind the island! 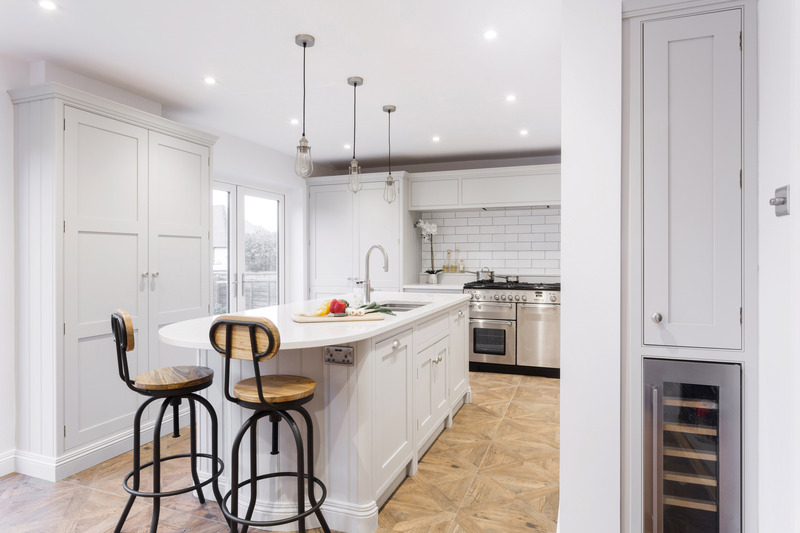 To create the open-plan room, the diving wall between the kitchen and the dining room was removed, however a load-bearing wall was essential for structural purposes, creating a small alcove that was the perfect spot for a wine cooler to be tucked into. The cupboard above is the perfect spot for storing wine glasses and tumblers within easy reach of the cooler, perfect for when entertaining. We believe every dream kitchen needs one of these!